The East African Legislative Assembly (EALA) Speaker Rt. Hon. Margaret Natongo Zziwa has been asked to step down. The Assembly that sat in Nairobi has this afternoon moved to elect Hon. Chris Opoka-Okumu to preside over the Motion for removal of Margret Zziwa. The Motion for the removal of the Speaker from office, which was cut short on April 1, 2014, has been revived and referred to the Legal Rules and Privileges Committee for investigations and the Committee has been given 21 days within which to finalize the investigations and to report back to the House. 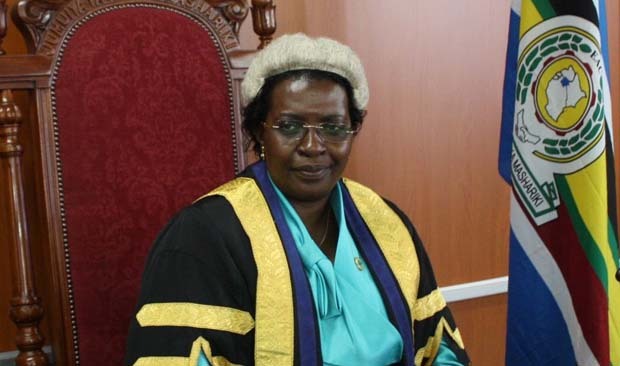 The Assembly further resolved to suspend Zziwa from exercising the functions of Office of the Speaker pending the finalization of the investigations into the Motion for her removal. The Motion was moved by Hon Abdullah Mwinyi. On 4th June this year, Rt. Hon Margaret Nantongo Zziwa ruled on the Motion for her removal to have fallen short of the requirements of signatures of atleast four elected Members from each Partner State and thus collapsed. This followed the withdrawal of signatures of three Members from the United Republic of Tanzania. Rt. Hon Zziwa pegged her ruling on Rule 82(2) of Rules of Procedure that grants the Speaker of the Assembly, the final powers on the interpretation and the application of the same. However, prior to that, the Counsel to the Community, Hon Wilbert Kaahwa had maintained that the Motion was “alive”. The Motion, initially introduced in the Assembly by Hon Peter Mathuki in Arusha during the Fifth Meeting of the Second Session of the 3rd Assembly was cut-short when it was adjourned on April 1, 2014 following two applications made at the East African Court of Justice (EACJ) halting the debate. The Motion among other things accuses Rt. Hon Zziwa of abuse of office and disrespect to Members. According to the provisions of Article 53 (3) of the EAC Treaty and Rule 9 of the Assembly’s Rules of Procedure, Members may with a two-thirds majority pass a Resolution to remove the Speaker from office. Addressing the media in Kampala earlier, Hon. Zziwa had vowed not to bow to any amount of pressure to resign.